Significant cost savings can be achieved in floor maintenance, by using tough, professional grade floor sealers instead of conventional floor finishes available from the big box stores. The savings in maintenance labor costs can be over 40% depending on how much traffic the floor takes and the frequency of cleaning. Further cost and environmental savings come from the elimination of floor stripping and the use of harsh cleaning chemicals in the maintenance process. We have developed low maintenance floor sealer that are extremely durable, oil and stain resistant Oil and dirt sits on the surface rather than being trapped in it. The surface becomes highly scuff and scratch resistant. 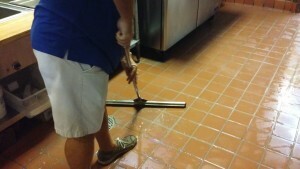 Finish floors are easily cleaned and maintain with just regular wet mopping or auto scrubbing. Our products are extremely UV resistant and when used outside do not yellow, keeping their look and physical properties for many years. The bottom line is that they last longer and they are easier to clean. 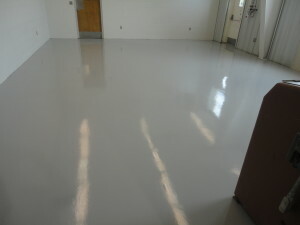 Cleaning the surface thoroughly is a critical first step for any coating or sealing project. However removing oils, grease, wax, fatty acids and other contaminants, is not easy! Even grinding and shot blasting without cleaning, will only push contaminate like oil and grease deeper into porous substrates. Regular degreasers just smear and spread oil over a wider surface area, leaving a residue that is just as much a bond breaker as the original contaminates. At CoverTec we focus on the best cleaning methods and products, for the coating process. We give careful consideration to the porosity of the substrates, how long it’s been exposed and the type and nature of the contamination. CoverTec specializes in floor safety. We have found that the two most effective ways to improve floor safety are firstly use the right type of floor cleaner and secondly, increase the traction on the floor. Believe or not one of the biggest culprit behind the slippery floor issue is the cleaner itself. Furthermore alkaline cleaners are the biggest of those problems. They are used for their degreasing/cleaning ability, but they leave behind a residue that when it gets wet, it becomes extremely slippery. Add to that cross contamination of oil or grease from the kitchen or workshop and you have a bad combination and a dangerous situation. Our CoverClean microbial products are traction enhancers that are incredibly effective on floors. CoverClean is completely alkaline free, and leaves behind no residue. The microbial action emulsifies and removes grease, oil and other contaminates from the microscopic pores in the flooring surface. Once the oil or grease has been consumed, any remaining dirt can easily be rinsed away, leaving the floor residue free. CoverClean HC is a very green cleaning process, cleaning without pollution. The product has no VOC’s is Non Hazardous, Non Flammable and there are no restrictions on the surfaces it can be used on. Changing or modifying walking surfaces is the next level of preventing slip and falls. Surface coating the concrete with an anti-slip product, can further improve safety and reduce risk of falling. However, it is critical to remember that anti-slip flooring requires good housekeeping as much as any other flooring. CoverGrip anti-slip floor treatment is designed to give coefficient of friction (grip, or traction) levels that are safer in wet or dry conditions. CoverGrip is manufactured from recycled eye glass lens which are ground into fine granules. Eye Glass Lens is a hard wearing polycarbonate plastic which is very tough, but light weight so it blends easily into our coatings. It is virtually invisible to the naked eye when used in our clear coatings and sealers. Products containing CoverGrip are classified as a High Traction, High Slip Resistance flooring systems, exceeding normal finished concrete or ceramic tile (wet or dry) and meeting and exceeding ADA standards. Our sealers and coating product has been independently tested and have a Wet SCOF of > 0.60 for wet walkway surfaces. When it comes to improving floor traction CoverGrip provides a cost effective solution for dealing with slippery floor conditions. Provide oil and chemical resistance solutions. 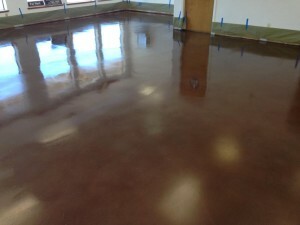 grease, oil and chemicals that normally soak into the concrete are easily removed from the sealer. Our sealers not only offer protection for concrete surfaces, but it can also protect ceramic tile and grout, natural stone and masonry surfaces. Our products are an ideal application for commercial and industrial areas where maximum oil and chemical protection is desired. CoverTec sealers will not only provide improved chemical and gasoline/oil resistance, but it will also prevent dusting, spalling and inhibit efflorescence. Clean-uptime is reduced and simplified since dirt, grease, oil and chemicals that normally soak into the concrete are easily removed from the sealer.